Photography courtesy of Berts Bricks. The University of Pretoria has released results of its Thermal Performance Study, which assessed operational energy use of structures built with six different walling materials. When selecting building materials, developers and architects of green buildings take into account the embodied energy of their raw materials. While this is an excellent start, in reality energy use over the life of the building dwarfs energy used during production. Operational energy use is an expensive, long-term cost for the property owner and a drain on South Africa’s limited resources. Annual Operational Energy is the sum of all heating, cooling and ventilation electricity costs accumulated over all four seasons in one year. This research is of particular relevance for affordable housing, as the residents do not have the money for high electricity bills. Therefore ethical housing developers should look beyond cost-cutting during construction, to take into account the long term expense of operation and maintenance. The size and use of a building influences its thermal performance. The design models applied in this study were used in prior research by the CSIR and the Department of Mineral and Energy Affairs. Best-practice construction methods were assumed, as required by SANS 10400 Part XA: Energy usage in Building and SANS204: Energy efficiency in building. a large 2000m2 commercial building that is unoccupied at night and on weekends. Variables such as floor, roof, windows, doors and occupancy patterns were kept constant. A wall lifespan of 40 years was estimated, although not all the walling types have been shown to have this lifespan. US housing lifespan is taken at 32 years, influenced by the use of timber frame and lightweight construction systems in the American housing market. South Africa has six major climate zones. Energy use varies depending on the location of the building – warm climate zones use more air-conditioning and ventilation, cold climate zones need heating. High rainfall areas need to deal with humidity and condensation. Lighting requirements have seasonal variations. Temperatures and other parameters used in the study are acknowledged averages for that zone. The measurements were based on the residents living in reasonable “thermal comfort” which is between 19 and 25˚C. The low density walling systems (timber and steel frame) show a trend towards higher annual energy use even when they have low U-values. High density walling systems (clay brick) consistently result in lower annual energy use even without additional insulation. 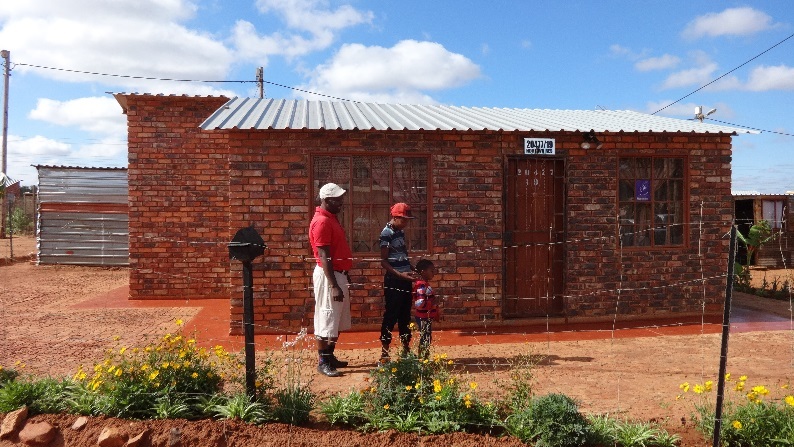 “Members of the Clay Brick Association of Southern Africa are pleased to see that the study corroborates existing national and international research for clay brick products,” says CBA Executive Director Jonathan Prior. “This research verified that any of the three clay brick walling formats provide property owners and residents with lowest energy usage and hence greatest thermal comfort. “This also shows the value of thermal insulation for residential buildings,” comment CBA Technical Director Nico Mienie. “It points to the need for changes in the SA building regulations to relook at the thermal resistance and heat bridging requirements of SANS 517 and SANS 10082. Caption: U-Value – long considered to be a good measurement of energy efficiency - has little correlation with energy use and electricity cost savings. Energy use does appear to correlate with material density. Prepared by the Department of Architecture, University of Pretoria. Authors: G Rice (Researcher), P Vosloo, H Harris, D Holm, N van Rooyen. The authors and any participants in this study cannot be held liable for any claim of damages of any nature whatsoever, arising from this study.